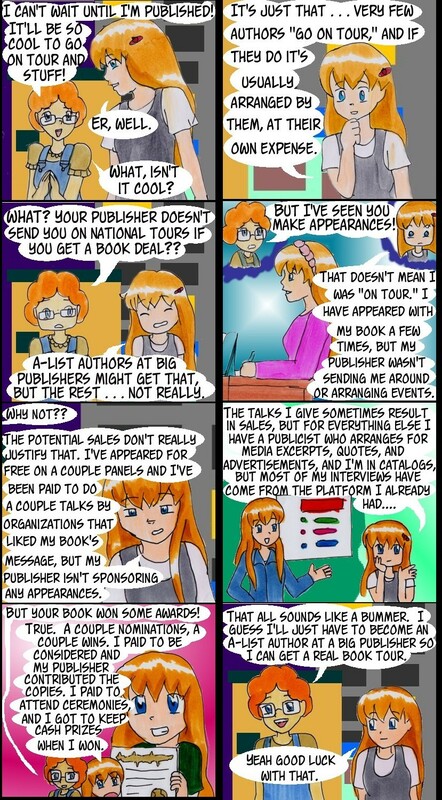 I mean, sometimes a publisher you sign with will book you for an event, or encourage you to appear at a group event, or ask you to arrange participation at a local authors’ event, or include you as one of their authors at a conference. And you don’t necessarily have to be a huge success to get those. But generally? You probably shouldn’t assume “book deal” goes hand in hand with glamorous all-expenses-paid tours where people line up to see you, all thanks to the hard work and dedication of your publishing team. They DO do a lot for you, even at smaller publishers. But unless your participation is allowing them to create sales where there wouldn’t have been sales, it is ever so unlikely that they will choose to pay your bill as you travel the country doing signings. I was my imprint’s bestselling book the year I was published. I did some appearances, but not because of anything my publisher asked me to do.